Besides their good looks, the Doodle is often looked to as a dog that can also be enjoyed b y people with allergies. It is often referred to as a “hypoallergenic” breed. This may be somewhat misleading, as there is no real hypoallergenic breed. Dogs can affect an allergic person in three main ways: dander, saliva, and even urine according to The American College of Allergy, Asthma, and Immunology. It is not the hair that is an allergen, although many people do associate a shedding coat with allergies. It depends on the level of a person’s dog allergies. Those with milder reactions and fewer symptoms are likely to be better able to live with a dog. How much physical contact occurs between the allergy sufferer and the dog is a large factor as well. Good management and cleaning greatly helps. Most allergy sufferers will receive relief from not allowing the dog on furniture or in the bedroom, by routinely vacuuming and cleaning the home, washing the dog regularly, and wiping the dog down with a towel in between baths. 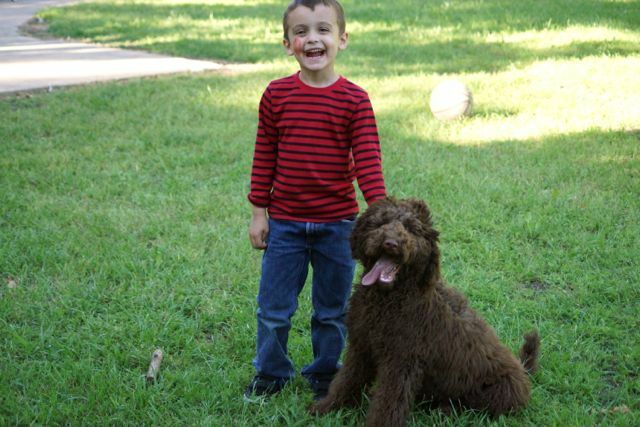 What helps the Doodle be more allergy-friendly than the average dog is his low or no shedding coat. Most Doodles, even those with more open coats shed far less than their retriever counterparts. Those Doodle coats that are more poodle like in nature shed almost nothing at all. This means loose skin dander becomes trapped closer to the skin and isn’t freely floating around the home. If an allergy sufferer is most allergic to the dander, a Doodle may make a wonderful canine companion. How can an allergy sufferer know which Doodle coat (more open vs. woolier) their Doodle would have? It comes down to genetics. A first generation breeding (F1), which is a purebred poodle bred to a purebred retriever (either lab or golden), can result in more open coats that do shed more since there is a greater variation in the coats. They will still shed far less than a full blooded retriever, but they will shed more than those Doodles with a woolier, more poodle like coat. 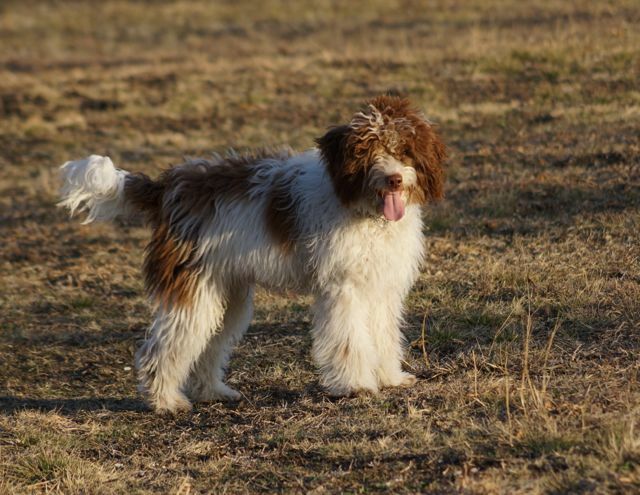 The Doodles with non-shedding coats are typically produced in further generations by breeding a first generation Doodle back to a purebred poodle (F1b). This breeding results in 75% poodle/25% retriever and creates coats that are more likely to be non-shedding. A dog from an F1b breeding would be a more likely candidate for an allergy sufferer. It is hard to determine what a puppy coat will look like in the adult dog, especially for the dog owner. 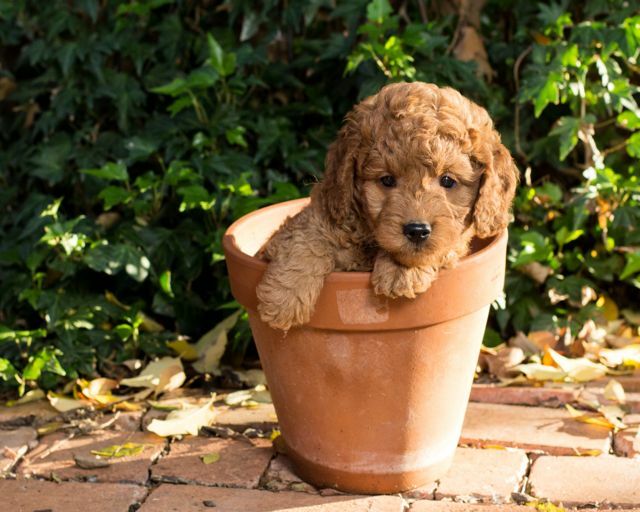 The best thing to do is ask your breeder to share many photos of comparable puppies and dogs to get a feel for what way the coat is likely to develop. The good part about a known dog pedigree is that there are fewer variables, and a breeder should be able to say, “Here is what this pedigree line has produced before,” and show you photos to give a clear idea. That way you can be assured of a Doodle with a more poodle like coat for the best results.